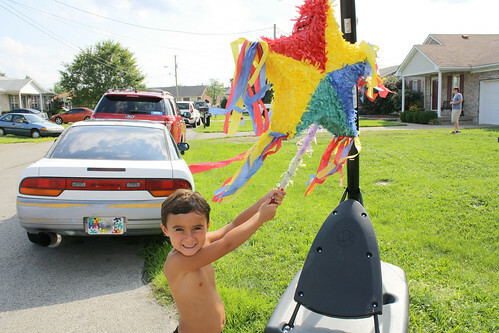 Craft E Magee: Super Sixth Birthday Blast! 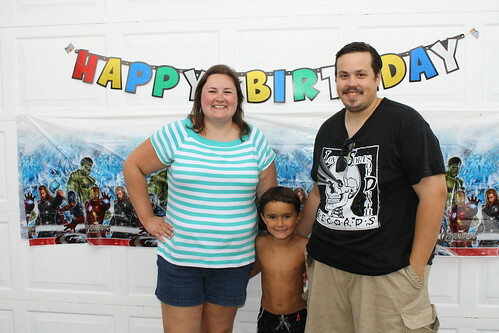 We had a 6th birthday this weekend, complete with a super-hero themed party for my nephew. This might actually be the third superhero themed party that he has had. 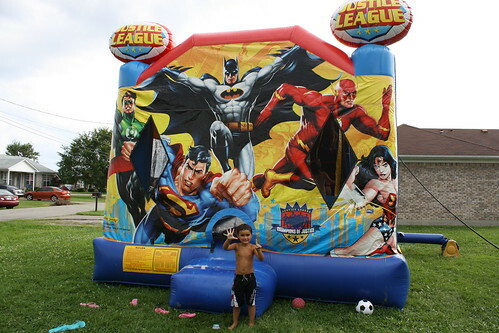 He had a Spiderman party at 3 and a Batman party at 5. This time he just picked all of the superheroes-The Avengers and The Justice League! What can we do? He loves Superheroes! 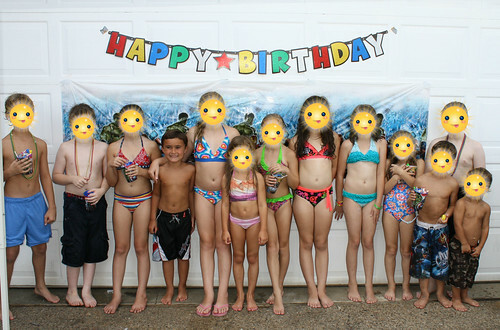 Since his birthday falls in the middle of the Summer, it usually makes for a very hot party. My parents spoil C with a air bounce with a water slide to keep the party cool for the kids. 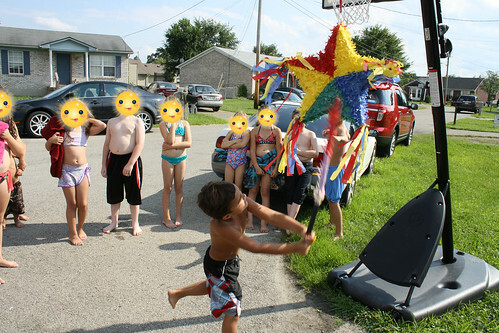 We also had a pinata, which all the kids loved, and pizza and cake. The cake was an awesome 3-tiered creation from our good friend Kruti of Kruti's Cake Bites. 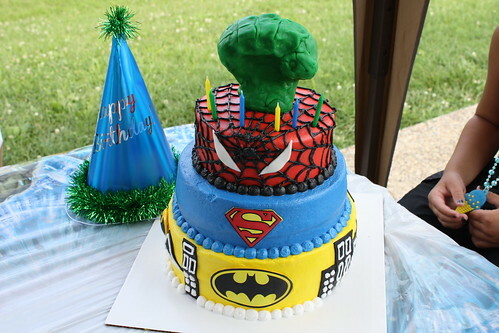 The Hulk's fist on top really makes this cake. Kruti says that the trick is molded rice krispy treats. For the other layers she used dyed frosting, fondant, and printed edible designs. 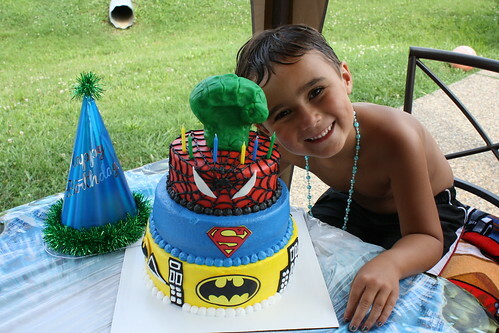 There was one plastic Batman ring stuck in the side of the cake for the Birthday Boy to keep. He loved the cake and the tiers were each a different cake flavor, per his request. The top layer was 'birthday cake' flavored with sprinkles, the middle was chocolate, and the bottom was yellow cake. I can't believe it, but in all of the madness I actually didn't get to eat a piece of the cake myself! It was gobbled up so quickly. I've had enough of Kruti's delicious cake bites to know why! Her baking skills are #1! C had the best time with friends and family to celebrate his special day. My favorite part of the party was when C opened his present from Joe and his eyes lit up. Ever since C was a baby, my boyfriend has given him a hand drawn card with money for his birthdays. The tradition began with an Elmo drawing and $1, then a Mr. Krabs card and $2, a Spiderman card and $3, and so on. 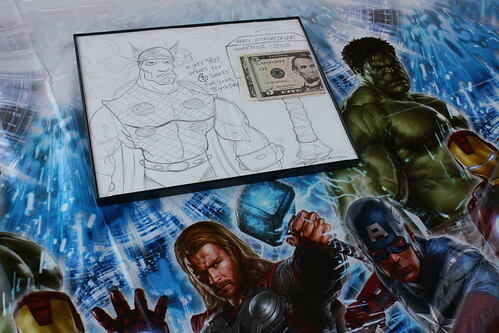 On Saturday, he got a framed Thor drawing with $6, and he exclaimed to his friends, "This is from my Joe. He's a great artist!" It just made my heart melt. I am so glad to have spent such a fun day with the people I love, celebrating the little guy that we love on his big day. 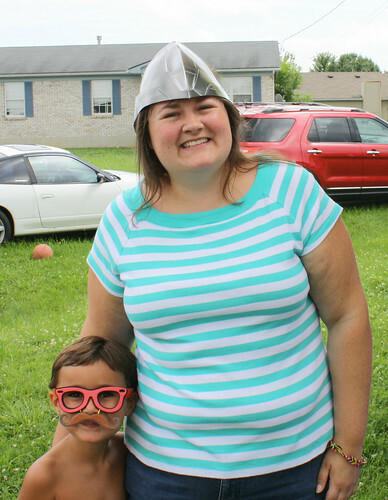 4th of July craft on WDRB!